Ofelita Velvet Skater Dress - I love a simple dress, and this velvet dress in a royal blue is perfect this season! So many ways to wear it as a dress made for winter. I'm thinking tights, a pair of out there boots and a coat with a fur stole swung over for a date night out look. Gabey Rose Embellished Swing Dress - Ooooooh. Isn't this one just the prettiest sparkly one of them all!? I spotted this one of them all first, and fell in love with it being a swing dress and completely embellished. I'm not an owner of a swing dress yet but I really do want one. Maybe not as loud as this yet, but it could bring me to buy this later on as a Christmas party dress! 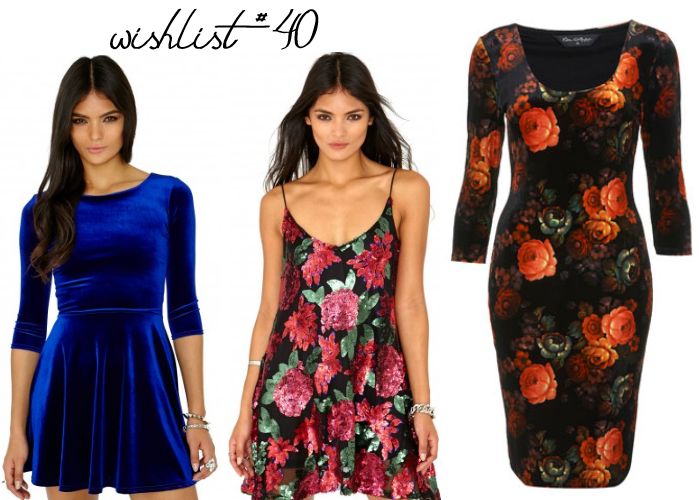 Floral Velvet Body Con Dress - After seeing this when it popped in stores this week I instantly fell in love with it. It's so much more vivid in colour and print than in the picture and it's no doubt I need it in my life! Such a pretty dress... Will someone buy it for me please? Or all three??? I couldn't pick which one out of the three though... If you had to get one. Which one would you pick? Ooooh I'm dying to add some velvet pieces to my wardrobe! That floral dress is so sweet too!